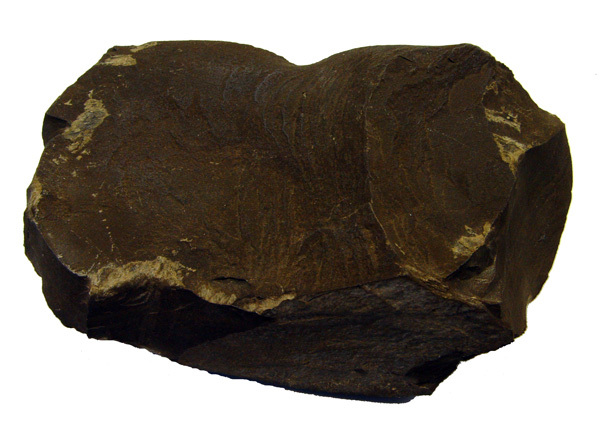 The term oil shale generally refers to any sedimentary rock that contains solid bituminous materials (called kerogen) that are released as petroleum-like liquids when the rock is heated in the chemical process of pyrolysis. Oil shale was formed millions of years ago by deposition of silt and organic debris on lake beds and sea bottoms. Over long periods of time, heat and pressure transformed the materials into oil shale in a process similar to the process that forms oil; however, the heat and pressure were not as great. Oil shale generally contains enough oil that it will burn without any additional processing, and it is known as "the rock that burns". Oil shale can be mined and processed to generate oil similar to oil pumped from conventional oil wells; however, extracting oil from oil shale is more complex than conventional oil recovery and currently is more expensive. 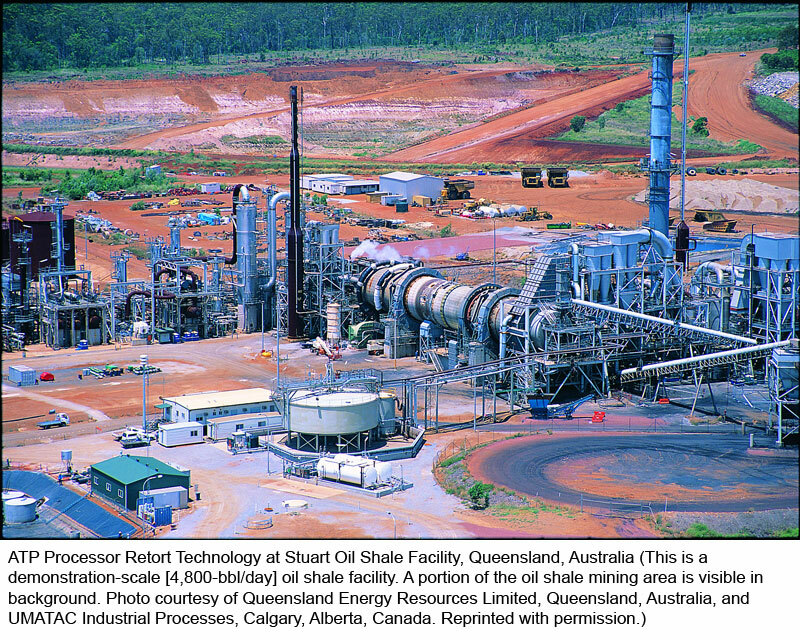 The oil substances in oil shale are solid and cannot be pumped directly out of the ground. The oil shale must first be mined and then heated to a high temperature (a process called retorting); the resultant liquid must then be separated and collected. An alternative but currently experimental process referred to as in situ retorting involves heating the oil shale while it is still underground, and then pumping the resulting liquid to the surface. While oil shale is found in many places worldwide, by far the largest deposits in the world are found in the United States in the Green River Formation, which covers portions of Colorado, Utah, and Wyoming. Estimates of the oil resource in place within the Green River Formation range from 1.2 to 1.8 trillion barrels. Not all resources in place are recoverable; however, even a moderate estimate of 800 billion barrels of recoverable oil from oil shale in the Green River Formation is three times greater than the proven oil reserves of Saudi Arabia. Present U.S. demand for petroleum products is about 20 million barrels per day. If oil shale could be used to meet a quarter of that demand, the estimated 800 billion barrels of recoverable oil from the Green River Formation would last for more than 400 years1. More than 70% of the total oil shale acreage in the Green River Formation, including the richest and thickest oil shale deposits, is under federally owned and managed lands. Thus, the federal government directly controls access to the most commercially attractive portions of the oil shale resource base. While oil shale has been used as fuel and as a source of oil in small quantities for many years, few countries currently produce oil from oil shale on a significant commercial level. Many countries do not have significant oil shale resources, but in those countries that do have significant oil shale resources, the oil shale industry has not developed because historically, the cost of oil derived from oil shale has been significantly higher than conventional pumped oil. The lack of commercial viability of oil shale-derived oil has in turn inhibited the development of better technologies that might reduce its cost. Relatively high prices for conventional oil in the 1970s and 1980s stimulated interest and some development of better oil shale technology, but oil prices eventually fell, and major research and development activities largely ceased. More recently, prices for crude oil have again risen to levels that may make oil shale-based oil production commercially viable, and both governments and industry are interested in pursuing the development of oil shale as an alternative to conventional oil. Oil shale can be mined using one of two methods: underground mining using the room-and-pillar method or surface mining. After mining, the oil shale is transported to a facility for retorting, a heating process that separates the oil fractions of oil shale from the mineral fraction.. The vessel in which retorting takes place is known as a retort. After retorting, the oil must be upgraded by further processing before it can be sent to a refinery, and the spent shale must be disposed of. Spent shale may be disposed of in surface impoundments, or as fill in graded areas; it may also be dispoed of in previously mined areas. Eventually, the mined land is reclaimed. Both mining and processing of oil shale involve a variety of environmental impacts, such as global warming and greenhouse gas emissions, disturbance of mined land, disposal of spent shale, use of water resources, and impacts on air and water quality. The development of a commercial oil shale industry in the United States would also have significant social and economic impacts on local communities. Other impediments to development of the oil shale industry in the United States include the relatively high cost of producing oil from oil shale (currently greater than $60 per barrel), and the lack of regulations to lease oil shale. While current technologies are adequate for oil shale mining, the technology for surface retorting has not been successfully applied at a commercially viable level in the United States, although technical viability has been demonstrated. Further development and testing of surface retorting technology is needed before the method is likely to succeed on a commercial scale. Shell Oil is currently developing an in situ conversion process (ICP). The process involves heating underground oil shale, using electric heaters placed in deep vertical holes drilled through a section of oil shale. The volume of oil shale is heated over a period of two to three years, until it reaches 650–700 °F, at which point oil is released from the shale. The released product is gathered in collection wells positioned within the heated zone. Shell's current plan involves use of ground-freezing technology to establish an underground barrier called a "freeze wall" around the perimeter of the extraction zone. The freeze wall is created by pumping refrigerated fluid through a series of wells drilled around the extraction zone. The freeze wall prevents groundwater from entering the extraction zone, and keeps hydrocarbons and other products generated by the in-situ retorting from leaving the project perimeter. Both mining and processing of oil shale involve a variety of environmental impacts, such as global warming and greenhouse gas emissions, disturbance of mined land; impacts on wildlife and air and water quality. The development of a commercial oil shale industry in the U.S. would also have significant social and economic impacts on local communities. Of special concern in the relatively arid western United States is the large amount of water required for oil shale processing; currently, oil shale extraction and processing require several barrels of water for each barrel of oil produced, though some of the water can be recycled.